A museum featuring three floors of clocks and watches from the 1850s to today’s latest technology. Presented by Timex Corp, it is located in a separate building, but included in the Brass Mall Commons shopping center general area. When the owners of Timex told a friend, Thor Heyerdahl, of their project, Thor’s family persuaded them to include an area featuring Thor’s travel in replicas of ancient boats from different areas in the Pacific. These journeys were to show possible contacts between ancient civilizations and the connections and mysteries we share. Stop in at the store and purchase timeless Timex products at discount prices. Hours are Tues.- Sat. 10 am to 7 pm. Ample parking is available. 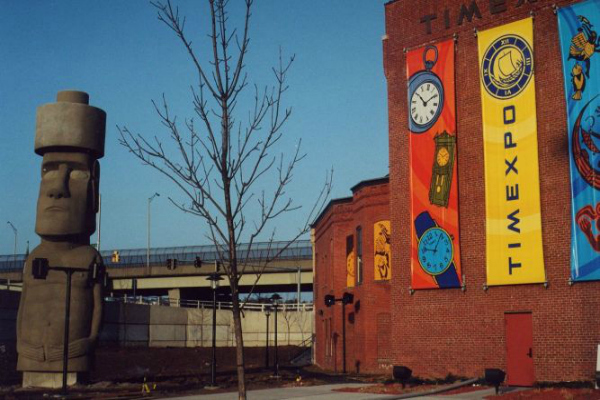 About Waterbury Clock’s many time-related inventions as you view our collection of clocks and pocket watches manufactured in Waterbury starting in the mid-1800s. Witness the impact of economics, marketing, major historical events and innovations as you journey through our history and the resulting modern day technologies. The role of the Waterbury Clock Company and its workers during the war efforts. Some of the earliest wristwatches were made by Waterbury Clock for the US Army for World War I. See fuses and other defense products manufactured by Waterbury Clock during World War II to help the Allies win the war. Over the nostalgic Timex torture test commercials featuring John Cameron Swayze and the origin of Timex’s famous slogan. Experience the boat motor test first-hand! Through a Time Tunnel back to the ancient world and marvel over the mysteries of Easter Island and connections across the seas in our “Coincidences or Connections” exhibit based on the explorations of Thor Heyerdahl. Visit the water table, a model of the Pacific Ocean, where you can experiment sailing boats with and against the currents. Learn about the Mounds of North America and their relationship to other mounds and pyramids around the world. This place is just loads of fun. My kids loved it and learned a lot about watches and also mysterious connections between ancient civilizations. I was surprised at how much we learned. It was really a lot of fun.